Mustard is a seed that shows up on grocers' shelves as whole seeds, as dry mustard powder, and as a prepared condiment. Among its many uses, it can spice pickles, emulsify salad dressings, and flavor hot dogs. Two main varieties of mustard seed are available. In American supermarkets, dry mustard powder is usually ground from yellow mustard while the spicier dry brown mustard powder is more popular in Asian markets. Prepared mustard includes a wide variety of condiments made from either type of dry mustard seeds. Finely ground mustard seeds are called dry mustard. Prepared mustard is dry mustard combined with a liquid such as vinegar, wine, verjus or even water to form a paste. The texture and flavor of prepared mustard depends on what type of mustard seeds are used, how finely the seeds are ground, and the other ingredients added. Mild American mustards are made with predominately mild yellow mustard seeds or a mixture of yellow and brown seeds. Medium Dijon-style mustard was originally a French mustard, but is now often made in America. It contains a mixture of yellow and brown mustard seeds and comes in a variety of textures from smooth to coarse. English mustards have a fine texture and hotter flavor than most American or French mustards. Spicy Creole mustard is made with coarsely grown brown mustard seeds. The hottest mustards are Chinese- or Asian-style mustards, made from dry mustard powder mixed with only enough water to wet the powder. Flavored mustards contain other spices such as tarragon, garlic, basil, peppercorns and horseradish that complement the flavor of the mustard. There are also German mustards that range from medium to very hot, and Irish mustards blended with whiskey, stout or honey. Add dry mustard as a flavoring ingredient in glazes for ham, pork roasts and fish. Use it to flavor salad dressings, curry, and cheese dishes such as fondue, souffles or plain old macaroni and cheese. Dry mustard mixed with water or citrus juice makes a dipping sauce for chicken, vegetables, egg rolls or dumplings. 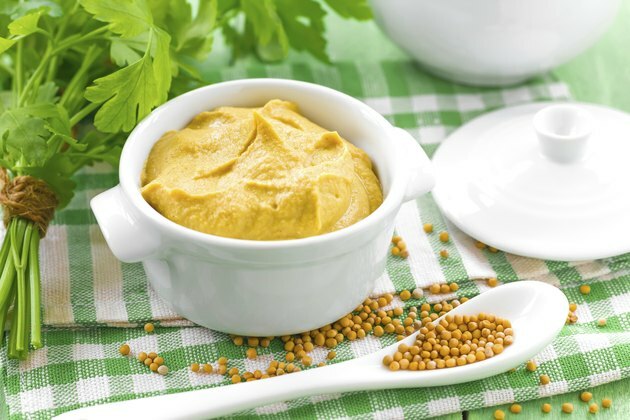 Both prepared mustard and dry mustard are used in vinagrettes and salad dressing for flavor and to act as an emulsifier. Use prepared mustard as a condiment for sandwiches, meats and burgers. Add it to sauces such as barbecue sauce, mayonaise and remoulade. Mustard sauces are a classic accompanment for meats such as salmon or rabbit. Use prepared mustard as a coating alone or with bread crumbs for chicken, fish, ham, pork and lamb. In most recipes, dry mustard and prepared mustard can be substituted at a ratio of 1 teaspoon of dry mustard equals 1 tablespoon of prepared mustard. In some cases you will need to adjust the amount of liquid used in the recipe, adding liquid to dry mustard or using less liquid with prepared mustard. A jar of mustard can sit in the refrigerator for a long time without spoiling, but once opened, the mustard flavors quickly fade. A jar of prepared mustard loses its pungency over time, so purchase mustard in small containers and replace it every six to 12 months. Mustard kept longer than 12 to 18 months is still usable, but its heat may be gone. What Is the Difference Between Coriander, Turmeric, Saffron & Cardamom?